The first question-and-answer of the Westminster Shorter Catechism tells us that the chief end of man is “to glorify God and enjoy him forever.” The apostle Peter would surely agree. As he puts it in today’s scripture, we are to “live for the will of God.” Yet don’t we often push God to the periphery of our lives? I pray that this sermon inspires us to put God back at the center. My family and I returned late Wednesday night from our vacation in Washington, D.C., and New York City. We rented basement apartments through Airbnb in both cities. Our place in Washington had private parking in an alley driveway. So we parked the car once, and took the subway or “Ubered” wherever we needed to go. But New York City was different. We rented a place in Brooklyn, and, like everyone else there, we had to park on the street. Can I tell you that the only thing I dreaded about the trip—the thing that filled me with the most fear about going to New York—was driving in the city and parking. 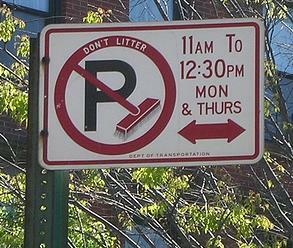 Lisa read that 40 percent of traffic in Brooklyn is people driving around looking for parking. Having now experienced it firsthand, I believe it! And you know, I just wanted to blend in with everybody else, but you can’t blend in with a Georgia license plate on back of your car! They see that and think you’re an idiot who doesn’t know how to drive! But you know what? We did O.K. And we learned how the system worked. Because here’s the thing: Even if you’re not going anywhere by car in New York City—even if you’re going to take the subway everywhere—you can’t leave your car parked for very long in any one place. Why? Because at least once—usually twice—a week, a street sweeper cleans alternate sides of each street, and you can’t be parked on one side of the street when that side is scheduled to be cleaned. The times are posted on signs. So for example, on Monday morning, “our” side of the street was being cleaned from 8:30 to 10:00 and then again on Thursday morning. Well, we were leaving on Wednesday, so we knew if we could only find a new space on Monday morning, we’d be golden. So early Monday morning we had to move our car. So Lisa and I got up early—Lisa accompanied me for moral support—to move our car and try to find an empty space somewhere else. And guess what? We failed. We found no empty spaces anywhere near home—except on the side of the street that was being cleaned, of course, which didn’t help. But I noticed something: many of the cars that had been parked on our side of the street were now double-parked, illegally, on the other side of the street. Their owners had parked them there until the street sweeper came, and it was safe to park on the other side. So I said to Lisa, “Let’s do the same thing.” So like a couple of old pros, that’s exactly what we did. Except the locals double-parked and went back inside their apartments. I was afraid to do that. So we literally sat in our car for 45 minutes, double-parked, until we saw that residents began moving their cars over to the other side—about 20 minutes till. Lisa has a friend in Brooklyn who told us that for most people who live there, this is all the driving they do every week: Moving their car from one side of the street to the other, and back again. Twice a week every week. Isn’t that funny? Their car is not an important part of their life. It’s there when they need it, but mostly they don’t need it: when they need to get somewhere, they take the subway or walk. And indeed there is, even in today’s scripture. How often is our relationship with Jesus Christ like that parked car in Brooklyn? It’s on the periphery of our life—not something at the very center of our lives—but more like something that we resort to in case of emergencies. We live as if Christ isn’t living in our hearts through the Holy Spirit; instead, he’s over there—a few blocks away. Sure, we may go to church on Sunday morning, but the rest of the week belongs to us. Instead of trusting Christ completely—instead of depending on him daily, hourly, moment-by-moment—we place our trust in other things and other people to get us through our lives. 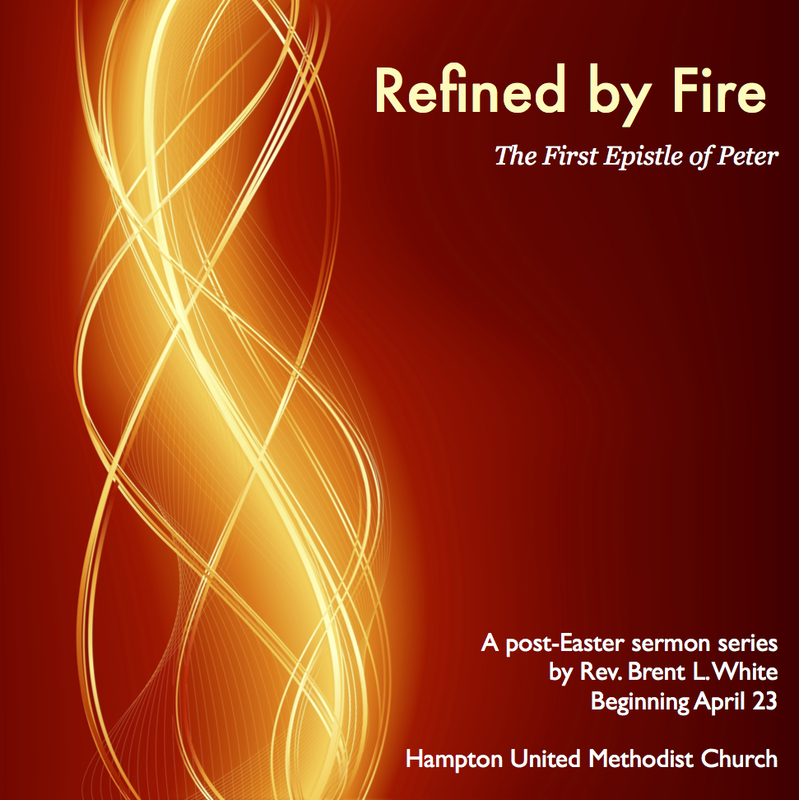 How different is the kind of faith that Peter describes in today’s text! Peter is telling us that living an authentic Christian life means putting our faith on the line every day! It means we are willing to suffer for our faith in Christ. It means we are willing to lay down our lives, if necessary, for the sake of Jesus Christ, his kingdom, and his glory! When we were in Washington the week before last my boys and I went to something called the “International Spy Museum.” Doesn’t that sound like fun? In addition to having props and automobiles from James Bond movies, they had genuine gadgets from decades past that actual spies used—hidden weapons—guns, knives, bombs that spies could conceal on their bodies—binoculars, telescopes, communication devices, various disguises… And they also these tiny containers that enabled them to hide cyanide capsules. Why? So that, if the spy were captured by the enemy, they would choose death rather than risk giving up state secrets. I’ve seen that in movies, but I wasn’t sure that was real. Well, it is! These spies would rather die than betray their king or country. There’s something admirable about that—that kind of loyalty, that kind of courage, that kind of self-sacrifice for a greater cause. But I get it: It’s very unlikely he’ll ask any of us American Christians living in or near Hampton, Georgia, to do that. We have religious liberty. We have the rule of law. We have rights under the Constitution. So we don’t suffer much for our faith—although many Christians worry that we will soon, as our American culture gets more and more hostile to Christianity. From Lincoln’s Second Inaugural. At the Lincoln Memorial, Washington, D.C. 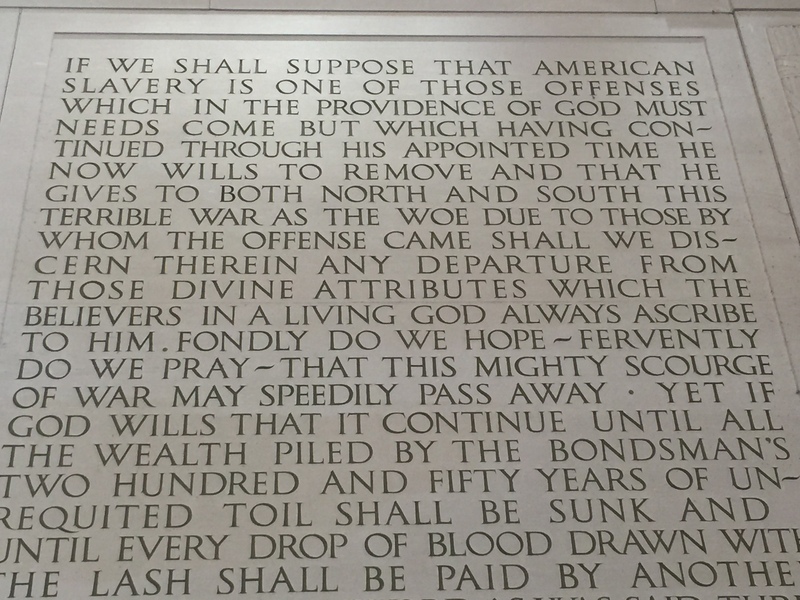 When we were at the Lincoln Memorial, my family took turns reading the text of Lincoln’s Second Inaugural Address—one of the greatest political speeches ever—which is engraved on one of the walls of the memorial. And when you read it, you can’t help but admire how freely and easily and sincerely Lincoln incorporated his specifically Christian theological convictions—related to God’s sovereignty, God’s providence, God’s judgment—into this moving reflection on the Civil War, which would come to an end in a matter of days. His words were profound, and profoundly Christian. If any president or politician spoke like that today, it’s not so much that they would face a backlash over separation of church and state—although I’m sure they would face that—it’s that most Americans wouldn’t understand what they were saying. Our culture has changed that much. They don’t share a Christian vocabulary. They don’t share Christian convictions. 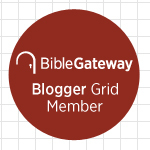 They’re not biblically literate! On one occasion last week, when we were on the subway in New York, a woman with a beautiful Jamaican accent stood up and preached the gospel on the subway train. It was a thoughtful, well-delivered sermon. And she even paused her speech at each stop to allow people to get on and off the train. And like everyone else on the train, I didn’t dare make eye contact with her, but I was listening intently to what she was saying. And to my surprise, everything she was saying was right on the money, theologically speaking. In other words, she was speaking the truth and she was doing so in a kind way. And I get it: Some people—at least those who weren’t ignoring her entirely—felt uncomfortable. Nearly everyone would have been happier if this strange person weren’t exercising her First Amendment right to free speech in this way. Regardless what you think about her, this woman clearly wasn’t preaching this message to win a popularity contest. She wasn’t trying to “blend in”—the way people like me want so desperately want to blend in. She wasn’t going along to get along. She wasn’t speaking the gospel truth in order to win friends or impress people. To her great credit, she didn’t care what other people thought of her—what they said about her, and, if push came to shove, what they did to her. Again, thank God we live in a nation that protects free speech and religious liberty. But even if we didn’t—if, God forbid, those rights were stripped away from us—don’t you get the feeling that this woman wouldn’t care? That it wouldn’t affect what she was doing? It takes courage to live like that! Why does she do it? Because she has obviously taken to heart the message of today’s scripture, especially verse 2, which tells us that we Christians are no longer supposed to live for “human passions,” or as the NIV puts it, “for evil human desires”—which includes a desire to “blend in”; a desire not to rock the boat; a desire not to step outside of our comfort zones. We live for one thing and one thing only: we live “for the will of God.” We live in order to do God’s will and not our own. Every moment of every day! We live our lives committed to one goal and one goal only: pleasing God, glorifying God, obeying God, doing God’s will. And Peter warns us here: This will bring suffering. Even if the suffering is ostracism and ridicule—harm to our reputation—not that those aren’t bad enough! I mean, think of the carefully curated images of ourselves we post on Instagram or Facebook or Twitter. We want everyone to see us in the best light. Literally. Watch teenagers take one selfie after another until they find the one that’s just perfect. This online avatar that we create isn’t real. It isn’t who we truly are—but we want other people to think it is. If we’re going to commit ourselves to “living for the will of God,” that will mean ultimately not giving a flip about our reputations, our popularity, our public image. And that will create suffering. And we’re supposed to be O.K. with that because our only interest is pleasing God. Are we O.K. with that? Are we willing to accept these terms? If not, are we willing to be disciples of Jesus Christ? Ask yourself that, because this is what discipleship requires. It’s not supposed to be easy. We’re supposed to have a willingness to follow Jesus even if it means suffering for him. And by the way, verse 1 is a difficult verse: It says that “whoever has suffered in the flesh has ceased from sin.” What on earth does that mean? It doesn’t mean that when we suffer for Christ we achieve sinless perfection. It means that when we are truly willing to “live for will of God,” even though doing so means suffering, then sin can no longer have the same power over us, or hold us in its sway. I mean, isn’t sin, at its base, an effort to satisfy ourselves, to make ourselves happy, to please ourselves even at the expense of everyone and everything else? When you’re so committed to doing God’s will that you’re willing to suffer for it, well… sin won’t be nearly so tempting, will it? It can no longer give you what you most desire, because what you most desire is pleasing God, doing his will, giving him glory. I know someone right now who has lost sleep this past week because of North Korea. She’s not alone: there are probably tens of thousands, maybe hundreds of thousands, of people who have lost sleep because of North Korea. Did you hear the news? As of last week, the North Koreans have demonstrated that they have the power to launch intercontinental ballistic missiles—ICBMs—that can reach as far as the midwestern United States. I mean, just a few weeks ago the experts were saying they could launch one as far as Alaska, but some of us probably thought, “Alaska is a long way away, and not many people live there, so… I’m not too worried about that. But now they can strike the heartland of the U.S.? And it’s not as if Kim Jong-un has proven himself to be the most “mentally stable” of all the world’s rulers! So why shouldn’t we lose sleep? Why shouldn’t we be afraid? I’ll never forget a hospital visit I made many years ago when I was in Alpharetta. I was visiting a man who was 86 years old. Eighty-six! He had enjoyed a long life of good health, but now he was in the hospital with a serious illness—and at the time we didn’t know if he would recover. But when I visited him, I was struck by the fact that he was so angry to be there. He resented that he had gotten sick. He was bitter and disappointed. He said, “I don’t know why this is happening to me!” in a very grumpy way. Let me leave you with this final point: It’s clear from today’s scripture that each one of our lives ought to have a B.C.—before Christ. “Before Christ I lived this way, now I live in this new way.” It’s clear that our lives after Christ ought to be distinctly different—from the way we lived before, from the way most people live today. Are they? Some of you this morning are no longer struggling with sin. And it’s not because through the sanctifying work of the Holy Spirit you’ve overcome sin; it’s because you’re no longer putting up a fight against sin. You’re just being carried away by it. Notice Peter refers to it as a “flood of debauchery.” That’s a great expression. It’s like a flood, and you are just going with the flow. If that describes you, it’s time to repent. It’s time to give your life to Christ. This entry was posted on	August 10, 2017 at 5:10 pm	and is filed under Uncategorized.